VISALIA – California quietly released its first ever list of the lowest performing schools across the state in January and Visalia Unified School District made some noise, but it wasn’t from a resounding clap of affirmation. This is the first year states have been required to publish a list of their lowest performing schools to comply with the federal government’s Every Student Succeeds Act. The intent of the Obama-era law was to hold schools accountable for their performance by identifying deficiencies in not only academics but social-emotional indicators to pinpoint support rather than punish schools with struggling pupils. California was only required to list the lowest-performing 5% of schools but instead provided a list of nearly 800 schools, just under 8% of the state’s 9,913 schools. The state’s list included 20 schools in Tulare County, 10% of schools within the jurisdiction of the Tulare County Office of Education, and seven from Visalia Unified School District (VUSD), which represents 17% of the district’s schools. Superintendent Todd Oto said VUSD sees the new accountability system as an opportunity to hone in on where schools need help the most. Under the previous system, California rated schools using the Academic Performance Index (API) to identify low performing schools solely on their state test scores on math and English. The new system takes into account other factors such as suspensions, chronic absenteeism, parent engagement, and school climate between students and parents, and teachers and administrators. “This system is better suited to improving schools instead of punishing them,” Oto said. Dr. Melanie Stringer, assistant superintendent of instructional services at VUSD, said schools were placed on the list for one of two reasons: low graduation rates and poor student performance across all areas. Three-hundred high schools with a two-year average graduation rate of 67% or lower were identified as low performing while 481 elementary and middle schools were defined by low state scores in five or more areas on the California School Dashboard, the California Department of Education’s school rating system. The only VUSD high school among the lowest performing was Sequoia High School, the district’s continuation high school, but five elementary schools and one middle school made the list. Of the 181 elementary schools statewide on the list, five were from VUSD. Larger districts such as Bakersfield City, Fresno Unified, and Los Angeles Unified, had less schools on the list. The only districts with more elementary schools on the list were Sacramento, San Francisco, San Diego, Stockton, West Contra Costa, and Oakland. The elementary schools identified on the lowest performing schools list were Pinkham, Goshen, Houston, Willow Glen and Royal Oaks. “There was a whole shock value when this news came to the schools,” Stringer said. The knee jerk reaction to seeing so many schools in one district on the lowest list is often pointing the finger at migrants and low-income students; however, these groups of students are more closely aligned with their classmates statewide than white students. Pinkham fared the best of the VUSD elementary schools on the list. Students there were just 30.2 points shy of meeting ELA standards and 58.8 points shy for math. Its highest achievement gap for ELA was for English learners but for math it was white students, as all other subgroups were within two points of the state average. White students were 48 points shy of the standard. Goshen Elementary had a lower suspension rate than the state in every student subgroup. Unfortunately, it had one of the highest rates of chronic absenteeism, especially for white students at three times the state average, and had the lowest academic scores in English language arts, 78.8 points shy of meeting standards, and math, 93.8 points shy of meeting state standards. The biggest gap was for white students in both ELA and math. White students were 114.6 points below the state in ELA and 85.9 in math. At Royal Oaks, white students fared the worst, falling 68.9 points behind the state average in ELA and 51.5 points behind in math. At Willow Glen the biggest gap in math is for white students who were 51 points behind the state average. No student groups were near the state average in ELA, but the biggest gap was for white students, which fell 47.3 points below the rest of the state. “These are very small subgroups so it is difficult to make that comparison,” Stringer said. Houston Elementary had the highest percentage of English Learners and socioeconomically disadvantaged students among the five elementary schools. Nearly all of its students were considered socioeconomically disadvantaged (94.3%) and almost half (45.5%) were English learners. Those are 20-30% higher than the state average. Its academic scores were the second lowest to Goshen Elementary. Houston only had nine white students, below the 11 required by the state to have statistically relevant sample. Pinkham has a lower percent of English learners but a higher percent of socioeconomically disadvantaged students than the rest of the state. Pinkham’s suspension rate of 6.1% was slightly higher than the state average of 3.5%. Similarly, the school’s chronic absenteeism was 16.4% compared with 9% statewide. Willow Glen has a similar student population to Pinkham and has lower suspension and absenteeism rates but also lower academic scores. In math, Hispanic and socioeconomically disadvantaged students are extremely close to the state average. At Royal Oaks, English learners did the best compared to the rest of the state in English language arts and math, where nearly every subgroup was ahead of the state. English learner and Hispanic students were suspended at a lower rate than the state while students with disabilities, socioeconomically disadvantaged, and white students were suspended at a higher rate. 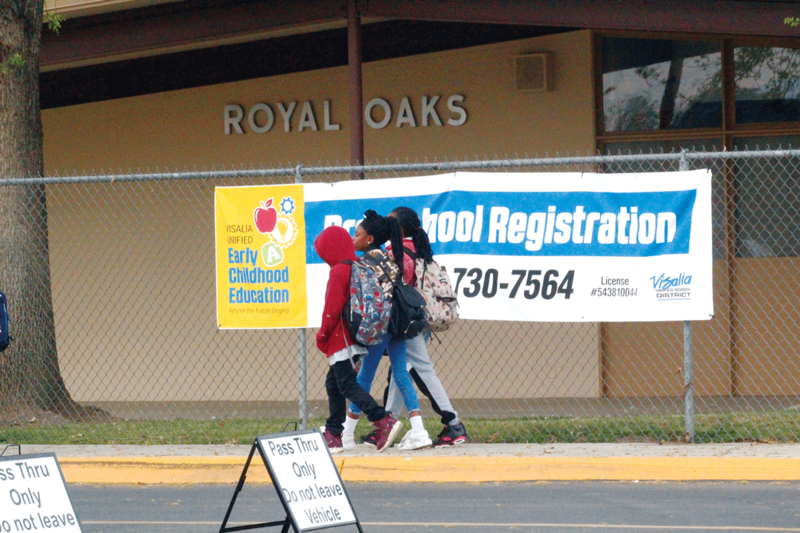 More students at Royal Oaks were chronically absent than the rest of the state. VUSD does have a history of identifying student shortcomings and working to close the gap. In the first year of the new accountability system, the California School Dashboard identified that VUSD foster youth were struggling with English language arts and suspensions. Stringer said VUSD worked with the county’s Foster Focus program to develop plans for students that followed them as they moved between schools within the district. They also provided foster students with backpacks and improved the state indicators from red, the lowest performing, to yellow, which means meeting standards. “We have seen great success with that program by identifying a gap in our system,” Stringer said. Stringer said VUSD is currently digging into the subgroup level of the data to determine the root causes at each site. Districts must then come up with a plan to improve the situation and the school board must approve the plan by June. Federal law requires that these plans have input from parents, teachers, and principals. None of the lowest performing elementary schools feed into Divisadero Middle School, which also showed up on the lowest performing school list. Royal Oaks and Pinkham are part of the Valley Oak Middle School boundary. Goshen is part of the Ridgeview Middle School boundary. Houston and Willow Glen are part of the Green Acres Middle School boundary. Divisadero did not score well in any one of the state’s performance indicators. It received the lowest marks for suspension rates. Divisadero’s suspension rate increased to 14.6% in 2018, more than four times the state average, a familiar stat for the school over the last three school years. Students with disabilities were suspended the most (25.6%) followed by English learners (20.6%), low-income (16.3%), and Hispanic students (14.7%). The rate for white students was 11.2% and Asian students was 8.3%. The junior high school also received the second to lowest scores in absenteeism, English language arts, and math. Divisadero also had a higher rate of chronic absenteeism than the state, 16.7% compared with 9%. One-third of students with disabilities were chronically absent, meaning they missed a month of the school year, which was twice the state average. About one in five low-income students missed school, 19.2% of English learners, and 16.4% of white students were chronically absent at Divisadero, also double the state average. About 16% of Hispanic students were chronically absent compared with 9.7% statewide. Statewide, California students were within 6 points of meeting the state standard for English language arts while Divisadero was 18.6 points below. Socioeconomically disadvantaged, and Hispanic students at Divisadero fared better than the state average while English learners were worse. In Math, Divisadero students were more than 80 points below standard compared with 36 points statewide. Every student group fared worse than the rest of the state, scoring 25-50 points lower than the state average in math. Divisadero does have a much higher percent of socioeconomically disadvantaged students. The state defines these students as those whose parents did not obtain a high school diploma, who are eligible for free and reduced priced meals, and considered migrant, homeless, or foster youth. More than three-quarters of Divisadero students meet this definition in one way or another. However, Divisadero has less students considered English learners than the state average and those learners are progressing at about the same rate as the rest of the state. Teaching experience may contribute to academic and social-emotional performance. VUSD has one of the highest teacher turnovers of any school district in the San Joaquin Valley and was well above the state average. At least one if five teachers (22.4%) was in their first or second year of teaching during the 2017-18 school year compared with 12.2% statewide, 12.1% in Fresno Unified, and 5.4% in Porterville Unified. Tamara Ravalín, assistant superintendent of human resources, said the state may define first and second year teachers differently than the district. Ravalin said VUSD had a total of 291 teacher vacancies in 2017-18, more than half took positions with other districts or left teaching, 13% retired, and nearly one-third resigned. The district hired 32 new teachers that year to fill positions vacated by teachers on assignment or simply to keep up with the growing enrollment. Of the district’s 1,300 teachers, 219 were in their first or second year of teaching, or 16% of the district’s teachers. The state lists that number at 299 teachers. Many of those new teachers are needed because more experienced teachers are being pulled from the classroom and placed on special assignment to support the next generation of teachers, primarily with a focus on literacy. The new teachers are often temporary as they are holding a spot for a teacher on assignment to return to the classroom after their mentoring is over. The district isn’t only recruiting new teachers. Ravalin said there is a statewide shortage of credentialed teachers and a national shortage of math, science and special education teachers. VUSD recruits these teachers from other states and offers signing bonuses paid out over three years. Superintendent Todd Oto said part of the issue is also growth. While many school districts in Tulare County are seeing flat or declining enrollment, VUSD is still growing. VUSD enrollment is growing at twice the rate of county schools overall (3%) over the last five years, or about 170 students per year. By comparison, Porterville Unified has only grown by 86 students total in the last five years and Exeter’s enrollment has declined by 250 students. This means the district has a disproportionate number of new teachers. Many of these teachers are being mentored by “teachers on assignment”, or veteran teachers who work closely with first and second year teachers. Greg Price, president of the Visalia Unified Teachers Association (VUTA), said teachers stay in a district for good working conditions or good pay. Teacher working conditions have come under fire in the district over the last year as teachers and parents have testified about the lack of discipline in the classrooms to the VUSD school board. At a March 7 study session, VUSD school board members heard a report on school culture and climate. Parents and teachers of elementary and middle school students told the board they were worried the district’s lack of discipline was putting other students at risk. Cary Peterson, a parent at Pinkham Elementary, said not removing troubled kids from the classroom makes it hard for the rest of the class to focus and learn. “Who’s looking out for my daughter?” she asked. Rachel Wilson, a science teacher at Divisadero, said the discipline problems at her school are “rampant.” She estimated her class loses 25 minutes of instructional time each day while she deals with disciplining students. Over the course of a 10-month school year, that translates to one month of instructional time lost. She said the outbursts, which included pulling their pants down to expose themselves, were all from a small group of students who make the others feel uncomfortable. “Last week, I had a student wanting to be homeschooled because she was afraid to come to class,” Wilson said. However, teachers at Valley Oak Middle School also spoke about issues at their school, which did not appear on list of the lowest performing schools. The same can be said for Royal Oaks, Willow Glen, and Houston elementary schools, which were among the lowest performing but did not have any teachers speak publicly about disciplinary issues at their school. Overall, about half of teachers surveyed felt like the district was adequately addressing disciplinary needs. Price, who taught for 24 years at Mineral King Elementary in Visalia, said he is pushing the district to include teacher input when considering professional development training. VUTA is also looking into how the district’s pay scale compares with surrounding districts. Of the eleven unified school districts in Tulare County (including an average between Tulare’s elementary and high school districts), five districts have an average teacher salary higher than VUSD. Visalia Unified’s average teacher salary is $73,249, which is lower than Dinuba, Cutler-Orosi, and Lindsay. “I suspect we are in the bottom half but we have not done a thorough analysis,” said Price, who explained there are many factors that affect salary including the number of instructional days, benefits, and pensions. “We can all make sure that Visalia schools are all places we want to send our kids to and where students feel they are getting the best education we can provide for them,” Price said.